Theresa Peterson has been an Alaska fisherman for three decades. During summer break one year in college she went to Homer, Alaska, to work in a cannery. She lived in a tent with friends. But after four days of being cooped up in the factory she decided she wanted to get a job on a fishing boat. Peterson told Ocean Views that she spent a week “hanging around the docks,” before she finally talked her way onto a shrimp trawler. “They said they’d take me out, but not pay me, if I would cook and help ice down the shrimp,” said Peterson. She was also asked to pick through the bycatch (unwanted fish and other organisms) and toss them back. Someone suggested she save the herring. She put some in a cooler, and then sold them to sportfishermen for bait when she got back to the dock. “I made $800 that day, that was my getting started in fishing,” she said. “I saw this incredible opportunity to work hard and make money.” Over the years, Peterson worked her way up in the physically demanding, traditionally male-dominated profession. She eventually bought her own boat with her future husband. 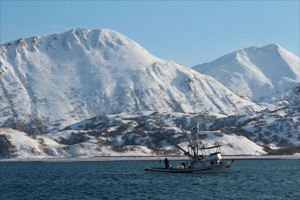 She said they benefited from provisions in Alaskan fishing laws that incentivize owner-operators. Peterson was in Washington, D.C., this week with her 23-year-old son, Charlie, who also fishes. In between checking his text messages, Charlie said that he “can’t be away from the ocean for long.” Dressed in a sport jacket and ball cap, the younger Peterson added that he worries about the future of fishing. Part of the problem, Peterson said, is that it now costs a lot of money to get the necessary permits or quotas to be legally able to bring in a decent-sized catch. “We have to keep opportunities for working fishermen,” she said. 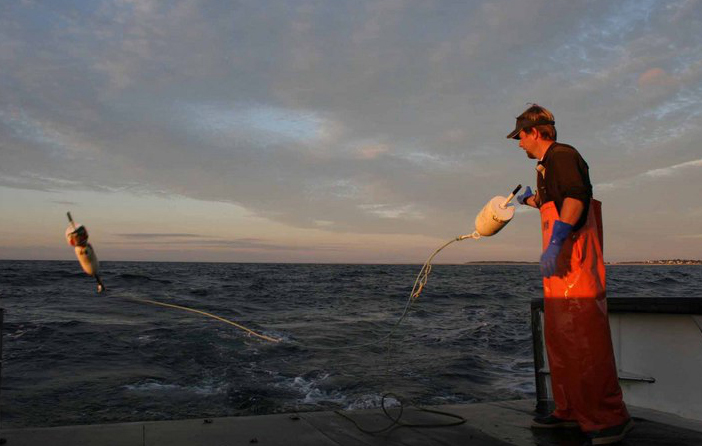 One way Peterson is working on that issue is through her recent grant through the Fisheries Innovation Fund, a public-private partnership between the National Oceanic and Atmospheric Administration (NOAA) and the National Fish and Wildlife Foundation (NFWF). With the funds, Peterson is working to organize Alaskan jig fishermen. “The jig fishery uses vertical lines with individual hooks. Each fish is hand handled,” said Peterson. “It’s a low-impact, low-volume fishery with a low bar for entry, since the gear is affordable.” She said a basic rig can be had for as low as $500, and a permit costs only $75. “I’ve seen people do it from skiffs,” she added. The problem is that the low volume makes it hard for jig fishermen to make a living, especially when rockfish is going for 25 cents a pound at the dock, or cod 28 cents a pound, said Peterson. However, she hopes that by organizing these small-scale fishers, they can start to do better. She is working on a website and quality and conservation guidelines and is helping the jig fishermen develop better systems for icing their catches. “We need to find these white tablecloth buyers that will appreciate fish handled in a different way,” she added. Her community’s fish will be processed in the U.S. and frozen only once, while most conventional seafood is now processed in China and frozen at least twice. Peterson was one of several fishermen and advocates gathered at National Geographic headquarters for a conversation called “Advancing Sustainability Through Innovation and Entrepreneurship.” Convened by NFWF and NOAA, and largely featuring Fisheries Innovation Fund grantees, the evening took place during the NOAA-led conference Managing Our Nation’s Fisheries III in Washington. The town hall-style debate took place as guests munched fresh scallops, clams, crab, and rockfish provided by various grantees. Carla Guenther from Penobscot East Resource Center, another Fisheries Innovation Fund grantee, pointed out that Maine has a very long waiting list for the storied lobster fishery. She said her state has a “license crisis,” and pointed out that her group is working to reduce barriers and red tape for locals and owner-operators, including at the statehouse level. Paul Parker of the Cape Cod Fisheries Trust outlined his group’s efforts to buy fishing quotas and hold them in a trust, to be shared by the local community. Ken Franke, president of the Sportfisher’s Association of California, said his group is testing acoustic receivers off San Diego, to see if descending devices are working. After an angler hauls up a protected species, he or she can return it to depths by using a descending device, which inventors hope reduces the mortality that comes from pressure shock. “In California sportfishing is a $2.2 billion business, and we hope to restore our access to the ocean,” said Franke, who noted that angler bycatch has resulted in restrictions. Brian Clark Howard is an Environment Writer and Editor at National Geographic News. He previously served as an editor for TheDailyGreen.com and E/The Environmental Magazine, and has written for TheAtlantic.com, FastCompany.com, PopularMechanics.com, Yahoo!, MSN, Miller-McCune and elsewhere. He is the co-author of six books, including Geothermal HVAC, Green Lighting and Build Your Own Small Wind Power System. Visit the Info for Fishermen page to find a helpful collection of information and web links for our fishermen. Site Designed by Hambone Design.